Rick Perry wants a second chance to run for President. He will announce his campaign tomorrow. 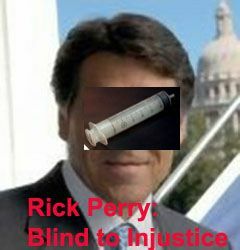 Texas Governor Rick Perry has been indicted in Texas on charges of abuse of power. Perry's lawyer calls it "partisan theatrics." I wouldn't be surprised if that's true. Shades of Tom DeLay? Texas Governor Rick Perry has officially declared himself a candidate for the Republican nomination for President. He and Mitt Romney are now considered frontrunners. No matter how disappointed you are with Obama and the Democrats, any Republican would be far worse. I don't want Republicans picking Supreme Court Justices. I don't want them making economic policy. They would be the worst by far on crime policy. Things are bad now, but there's no need to make them worse.